- Complete rewrite of all navigations/inspections, supporting autocompletion/error-highlighting etc. - Validator: validation.xml: autocomplete/highlight/navigation to form/form-property, message-keys; JSP: "formName"
Thanks to everyone who tested/commented during the beta versions! Uh. It does seem to work differently than the previous version. Is it supposed to manage a situation like the following? Also, it does not seem to recognize my tiles definitions anymore: it shows them as red (but it is still able to ctrl-shift-I them or ctrl-B to them!). I'm afraid... could it be that I have the Struts assistant installed? This should work. I suppose both actions are declared in the same struts-config.xml? Do you get proper autocompletion with action-path entries (.do) ? Please check the settings tab if all struts-config.xml files and corresponding tiles-defs.xml files were properly recognized. If not, please check first the configuration steps on the plugin homepage. Struts Assistant should not have any influence on Struts Plugin. didn't you get a warning message on startup? Whoops, do you mean THAT message? I imagine I read it the first time, and then... just ignored it, seen that everything seemed to work. Then when I reinstalled your plugin it stopped working: maybe there are dependencies on the order plugins are installed? Sorry, and thanks for your help. , and the plugin reports no struts-config.xml found. Please check it. It is generate by XDoclet and exits in some 1.2.x verion, and I think you can include it. Well, it does not exist in 1.2.6 /1.2.7. Could you point me to the version where this old URI is used? value that may be incorrect when the form type is a dynaform. 2 * Clears all JXPortal caches. 2) Forward "clearCaches": I suppose this method is in DispatchAction (or subclass) - do the other "execute()"-methods work regarding resolution of possible ActionForwards? Config looks OK at first glance. 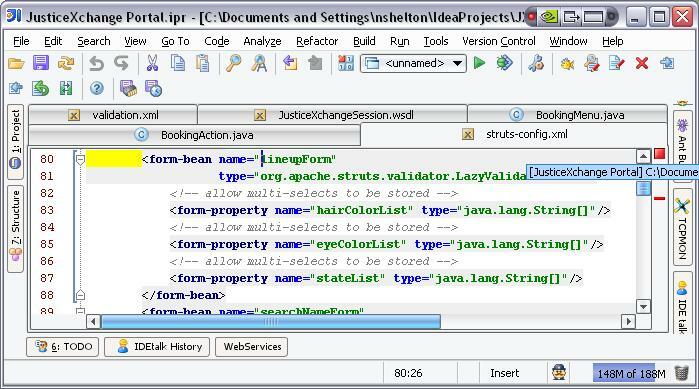 with the formbean-name defined in struts-config.xml; reference to formbean via action-path is currently not supported. The clearCaches forward appears to be the only one that it cannot find. and Struts plugin raises error,but it is correct. and I think a lot of tools still use this doctype, please add this doctype support. Ok, now I see the reason for the errors in your validation.xml - it's a LazyValidatorForm. Will add support for this as well in next version. Will try to investigate again regarding resolution of ActionForwards in DispatchActions.